A group of Catskill (and beyond!) knitters and crocheters gather twice a month to work cooperatively on a clandestine public art project. 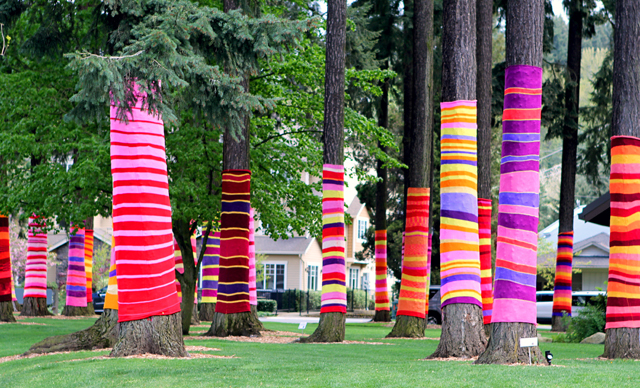 Yarn bombing is a public art movement where community members cover everyday items in colorful yarn creations, bringing bright colors and a new perspective to Main Street everywhere. The meeting location and yarn bombing targets remain confidential to preserve the element of surprise that comes hand-in-hand with yarn bombing. However knitters and crocheters, beginners and experienced, near and far, are invited to get involved. For more information contact Roxbury Arts Group Executive Director Jenny Rosenzweig at jenny@roxburyartsgroup.org or 607.326.7908.